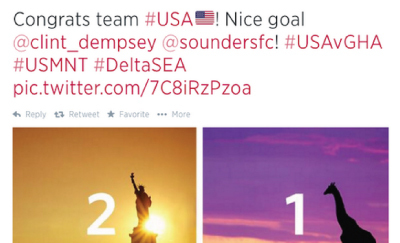 MG: So the social strategist at Delta accidentally thought there were giraffes in Ghana. I mean there are giraffes in Africa right? Peter: Yes. Ghana has Elephants. Lions. I feel like it’s not insane to conclude that Ghana might also have giraffes. MG: Meanwhile that poor social manager is like.. drinking heavily somewhere. Peter: ..questioning their life decisions..
MG: ..pondering why they didn’t work for the government. Maybe as a postal carrier. Peter: ….what do you know about postal carriers that I don’t? MG: Work outside, get exercise (multi-tasking), government job ($$). And I bet you could read other people’s magazines before you deliver them. Peter: You cooooould maybe. But it’s a federal crime to read other people’s mail. MG: Magazines do not count. Peter: is your name on the magazine? MG: Peter are you going to call the cops on me? Peter: I think it’s more of a citizens arrest kind of scenario.